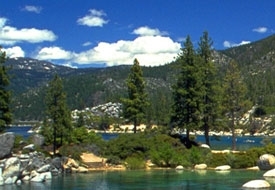 Sierra Nevada College is in the scenic Lake Tahoe Basin, known for its pristine environment and year-round recreational activities. MIDDLEBURY, Vt. — Beginning in summer 2013, Middlebury College will launch a new four-week leadership and innovation program at Sierra Nevada College (SNC), located near the shores of Lake Tahoe in Incline Village, Nev.
Called MiddCORE Immersion, it is open to students and recent graduates from any college or university and will take place June 17-July 12. The new program features mentors, ranging from CEOs, politicians and entrepreneurs to artists and actors, who will provide students with intensive hands-on challenges and skill-building workshops. Such skills include leadership, collaboration, strategic thinking, persuasive communication, crisis management and financial literacy. The program will enroll up to 60 students the first summer. The strong focus on experiential learning and mentors is similar to that of the other programs and classes bearing the MiddCORE name at the college, where MiddCORE began five years ago as an intensive January term course for Middlebury students. In January 2013, the college will offer this course at both Middlebury and, for the first time, the Monterey Institute for International Studies, a graduate school of Middlebury College in Monterey, Calif. A summer internship program and a workshop series ― both based at Middlebury ― also fall under the MiddCORE umbrella. “Students will leave the program with a network of supportive peers and mentors, and a newfound confidence in their abilities,” she added. According to Holmes, Sierra Nevada College is an excellent site for MiddCORE Immersion, especially since it is a summer program. SNC’s small size and picturesque location along the shores of Lake Tahoe provide the perfect setting for learning and collaborating in small groups – an integral part of the MiddCORE experience. The institution’s strong emphasis on entrepreneurship and outdoor leadership ― during the time of year when outside activities are most accessible ― will also provide additional curricular resources. “We’re very pleased that the program will be located at SNC,” said Holmes. According to Gillette, MiddCORE at Sierra Nevada College will benefit not only from the incredible natural environment of the Tahoe Basin, but also from the cadre of highly accomplished men and women who live in Incline Village and the region. “There are many individuals here who have had remarkable careers and have much to offer as mentors,” said Gillette. Admissions are rolling but Holmes strongly advises students to apply by Jan. 15 since enrollment is limited. More information about MiddCORE Immersion, including admissions information and cost, is available at http://middcore.middlebury.edu/. Sierra Nevada College is a private liberal arts college on the shores of Lake Tahoe in Incline Village, Nev. It is located about 45 minutes from Reno, Nev., two hours from Sacramento, Calif., and just over three hours from San Francisco. The Lake Tahoe Basin is known for its spectacular scenery, pristine environment, and superlative year-round outdoor recreational opportunities. Students will have access to activities that include white water rafting, sailing, paddle boarding, kayaking, rock climbing, backpacking, mountain biking, hiking and wildlife observation.